Since 2003, VHDA has provided financial assistance to people with disabilities through our Rental Unit Accessibility Modification (RUAM) grant. The program began as an outreach effort between VHDA and the Christopher Reeve Foundation and has helped over 720 households throughout the Commonwealth. Financial assistance to make housing more accessible is provided through the REACH Virginia program. VHDA’s RUAM grant helps pay for modifications to rental units occupied by the elderly, adults with disabilities and families of children with disabilities who earn 80 percent or less of the area median income (AMI). Grant funds up to $2,800 per unit may be used to widen doorways, lower countertops, install wheelchair ramps and make other modifications that improve accessibility and safety. Can Boomers Make Cohousing Mainstream? Small to Go Big in 2015? Maybe. Finally. Here’s why. Talkin’ Right, Leanin’ Left: The ‘New Consurbanism’? Obtaining a mortgage loan: How do we know if it's too hard, too easy, or just about right? Today’s post is a collaboration between VHDA and People Inc. of Virginia. Housing professionals in the Northern Shenandoah Valley are joining together to expand homebuyer education opportunities. They recently completed VHDA's Homeowership Education Train-the-Trainer Program, the first step towards teaching VHDA‘s First-time Homebuyer class. Although local housing professionals streamline the home purchase transaction as much as possible, buyers benefit when they are knowledgable as well. How do buyers achieve this? Through the free class offered by VHDA’s Homebuyer Education program. Class topics include: personal finance, credit and credit issues, role of the lender, working with a Realtor®, the home inspection and loan closing. It provides homebuyers with a curriculum that is standard throughout the state, with a strong emphasis on education without solicitation. What effect do VHDA's activities have in YOUR community? 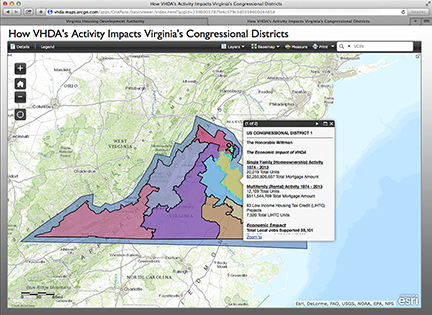 Here's an easy way to see the economic impact VHDA is having in your area, and all over Virginia. VHDA welcomes the five new members joining the board of the Arlington Partnership for Affordable Housing. We look forward to working with Yvonne Aiken, Nadia Conyers, Jay Harris, Paul Holland and Rev. Andrew Merrow, as well as the rest of the APAH organization, in our continuing partnership to provide affordable housing for Arlington residents. VHDA is proud to announce that we recently were awarded the Virginia Council on Economic Education’s Partnership Award for our longtime dedication to economic education in schools across the state and our service to VCEE. For more than 45 years, VCEE has been a driving force behind getting economics and personal finance into Virginia’s K-12 classrooms. Annually, VCEE’s affiliated centers for economic education provide more than 200 workshops reaching more than 2,500 K-12 teachers, providing them with resources and materials they can use to help students become competent decision makers, productive employees, innovative entrepreneurs, thoughtful investors, and financially responsible individuals. Homebuyer Education Train-the-Trainer. VHDA’s Housing Education department provides those who are interested in teaching our First-time Homebuyer class with a ”Train-the-Trainer” course. This half-day training covers the curriculum for our First-time Homebuyer class, and explains the specific responsibilities of a facilitator. The course is held monthly in various locations across the state. To sign up, visit vhda.com/trainthetrainer. Housing Counseling Program. Our Housing Education department also offers training and technical assistance throughout the year to non-profit agencies participating with VHDA through various housing counseling grants. Training opportunities are available to all housing counseling entities in Virginia. To learn more, email vhdagrant@vhda.com. Marketing 101. VHDA’s Marketing department offers an introductory presentation covering How to Reach Your Audience, Websites, Social Media, Event Management and Creative Strategy Development. The Marketing department also provides consulting to partners, ranging from a quick marketing review and emailed recommendations to a site visit and development and implementation of specific strategies. For more information, contact Marketing Director Robert Halloran at Robert.Halloran@vhda.com. Revitalization Training. VHDA’s REACH Virginia department provides “Revitalizing Neighborhoods through Housing and Economic Development” training. This two-day, interactive session focuses on the importance of housing opportunities for neighborhood revitalization. Training is typically conducted in partnership with the Virginia Chapter of the American Planning Association (APA-VA) and the American Institute of Certified Planners (AICP). To learn more, contact REACH Team Director Elizabeth Seward at Elizabeth.Seward@vhda.com. Challenges of Community Design. 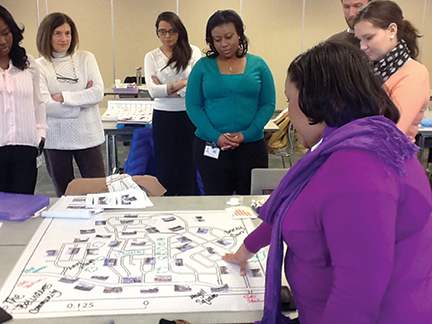 Our REACH Virginia department also offers a two-hour workshop focusing on the challenges of community design. Participants engage in a series of quick group exercises during which they identify their individual design preferences from a series of pictures, develop a group consensus concerning the design of key community assets with a focus on housing, and place the assets on a community visioning map. Each group then presents their community vision to the other groups for discussion. For more information, contact REACH Team Director Elizabeth Seward at Elizabeth.Seward@vhda.com. How Hard Will New Home-Loan Limits Hit Veterans? EarthCraft Virginia, one of the largest regional green building programs in the country, is a leader in providing ongoing educational opportunities for home builders, developers, contractors, and anyone else involved in the construction and maintenance of housing. In addition to their ongoing lecture series, EarthCraft Virginia has announced a Building Professional Training course to be held from 9 a.m. to 4 p.m. on January 20, 2015. This comprehensive overview will be held at VHDA’s Virginia Housing Center and costs $175 per attendee, which includes lunch and training materials. It’s open to all who wish to attend, so if you’re interested, register on the EarthCraft Virginia website.